Is your vehicle giving you problems? If your vehicle is not drivable or not safe to drive call Sergeant Clutch. We offer 24 Hour Towing Service in and around San Antonio, Texas. 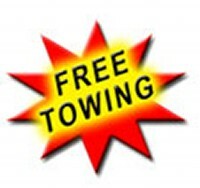 Ask about Free Towing with your Repair Service. Valid up to $75.00 off Tow Bill with Qualifying Repair Service.